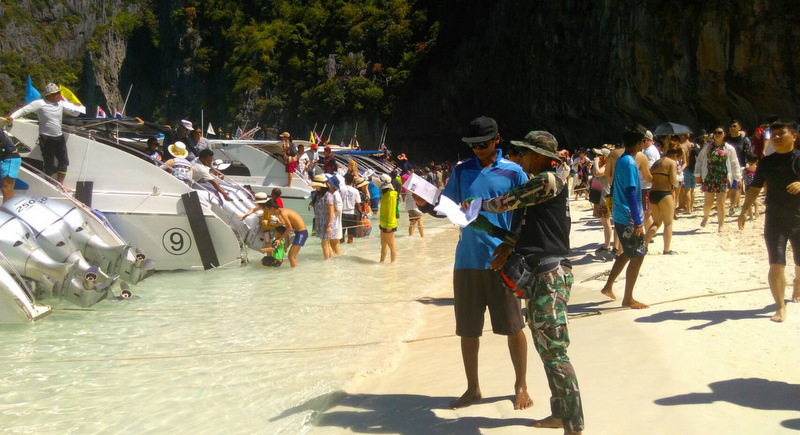 PHUKET: The news that national parks officials have resolved to forbid tourists from entering Maya Bay – the crown jewel of Had Nopparat Thara – Phi Phi Island National Park – during a June-September “recovery period” and to limit visitor number during the tourism high season has been well received as a positive step. Maya Bay is under intense environmental pressure as the most visited national park in the country, with about 4,000 visitors a day and a total of 1.7 million visitors last year. The move is no small step for officials, long scoffed at for allowing the mighty tourism baht to dictate if and how to start protecting the region’s natural beauty from over-tourism. The Maya Bay restrictions will hit the state in the pocket, located as it is in the most profitable national park in the country, which last year alone collected a reported B669mn in entry fees. Indeed, Ao Phang Nga National Park right next door is the second most heavily visited park in Thailand with 1.3mn tourists last year putting B390mn into the state’s coffers. Together with Mo Ko Similan National Park, which made B307mn last year, this trio of national parks, whose visitors commonly use Phuket as their jumping off point, raked in just over B1 billion last year. To put that in perspective, all Thailand’s national parks combined last year generated B1.8bn in total. However, the move has been criticized for being poorly thought out – impractical in a country that struggles to enforce many similarly well intended laws due to bureaucratic inertia and corruption. Just how the ban will be enforced has yet to be revealed. Had Nopparat Thara – Phi Phi Island National Park in particular has come a long way since 2015, when the-then park chief Chaithach Boonphupantanti was transferred after he was unable to account for an estimated B30mn a month in park fees that went missing under his watch. Those figures alone highlight how just how lucrative Maya Bay is for the tourism industry. If parks officials are serious about preserving the jewels of Phang Nga Bay, they will roll out similar restrictions at other popular yet environmentally fragile sites, further reducing tourism income. Regardless, limiting visitor numbers is a welcome move that was long overdue. Just look at Coral Island, which has already lost three-quarters of its coral reefs to the devastation wrought by unfettered tourism. Just 4 months recovery time only. Laugh about it. After September they allow a increase of visitors to make up the financial losses of period June-Sept which is low season anyway. The whole June-Sept 'operation' is just cosmetic. Afterall, the private coffers must be filled as well, not forget that.